It's a good idea to subscribe regularly to a few of the better flower gardening catalogs - whether online or in print - for ideas, inspiration and as an aid to plan your gardening projects. Though many catalogs do give general information about flower species and their needs, if you're new at flower gardening, you really should check out a gardening encyclopedia or a general book or website before you do any ordering. Don't depend on them to give you all the details and explain gardening terminology (which could make understanding the catalog near impossible). Before you dive into an ordering frenzy, make sure you're aware of a particular flower's sun, soil, and water needs, its height and width at maturity, and when it should be planted. If you want to try your hand at starting a garden from seed, you should know if the seeds you need to order should be directly sown or started indoors; if you're ordering a plant that has already started growing, you should know if it will arrive bare-root or potted. Make sure you understand the symbols that flower gardening catalogs use. 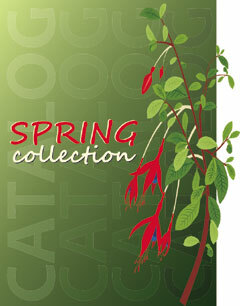 Symbols are a shorthand way of describing what a particular plant requires, but they can vary from catalog to catalog. It's obviously important to know what it is you're reading. Don't go overboard your first time ordering products. Start small and easy, see how that goes and gradually progress to more complex flowers and maybe larger quantities (obviously, if you have the space). Things are slightly different if you're a gardener that has already had experience of mail order gardening. If this is the case, take advantage of the variety found in flower gardening catalogs and play around with a couple of new species. That said, though, don't buy something just because it is new and different; no matter whether you're a new or veteran gardener, you should always pause and think about how a new order will fit into your garden, if at all. If you choose to order plants, make sure you go with a company that's been in the business for a while. Seedlings need to be very well taken care of during shipping or they will arrive on their last legs and have a good chance of not surviving. Companies that have been around for some time usually know just what to do to ensure that your new friend arrives as healthy as possible. If the company is experienced at selling and shipping seedlings, you'll most likely get smaller plants that will arrive at the perfect stage for planting and will have quite a long life ahead of them. Also, find out if the company grows its own stock or resells someone else's stock. Definitely go for the company that grows its own products; you can call the company to verify this. If the catalog doesn't have a phone number for the company, maybe it's best if you don't order from it. Before ordering anything from any catalog, make sure you shop around both for prices of products and for reviews on the companies from which you're planning to buy. Keep a list of everything you order and before placing next year's order, go over your list and see what worked and what didn't. To help in this task, take pictures of your garden at regular intervals and date them; this will help you analyze what grows well and it will also remind you what you need to order more of. Note: We'd love you to send us your favorite flower gardening in containers ideas and pics to feature on our new pages!